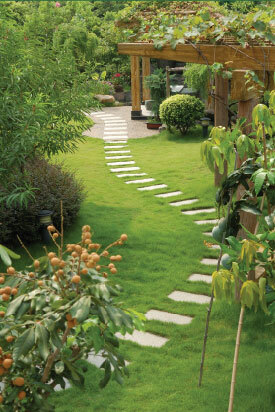 If you want to maximise the space in your garden a good place to start is at the edges. Most gardens need some kind of physical barrier around the boundaries for privacy and security, but choosing the wrong sort can make your garden seem smaller and even reduce the amount of space available for planting. A hedge makes an attractive, natural background to a garden but it needs quite a lot of space and will compete with nearby plants for water and soil nutrients. You’ll also need to clip it regularly. An overgrown hedge will take up even more of your valuable garden space! Although fences are much narrower than hedges they can spoil a garden design that’s intended to create an illusion of spaciousness by making it very obvious where the garden ends. A uniform fence all around a garden can too easily become the first thing a viewer notices, giving the impression that the garden is much smaller than it really is. A tall fence can also block out a lot of light, which could be a problem if you want to grow sun-loving plants. There is a way to enclose your garden without making it look and feel oppressively closed-in, and that is by using a sturdy fence to support climbing shrubs and creepers. Creating a smart living fence in this way softens and blurs the straight edges of a fence and also allows you to extend your planting in a different direction so you can add more variety and interest to your garden. Because most of the fence will be hidden behind plants it won’t look odd if you choose several different styles of fencing for different parts of the boundary. Where privacy is the main consideration you might want some tall, solid fencing panels. If you just want to screen out an unattractive view, a stretch of trellis will provide enough support for the plants yet allow light to filter through. In another place a low, solid fence topped with trellis could be the perfect combination. By using a mixture of plants to cover your smart fences you can enjoy a succession of different scents, colours and patterns throughout the year. The main problem in choosing climbing plants is that there are so many! Amongst the most popular are climbing and rambling roses, clematis and wisteria for their beautiful flowers, jasmines and honeysuckles for scent, Boston ivy or Virginia creeper for colourful autumn foliage, and pyracantha for bright winter berries. When buying plants check if they will scramble up fences or trellis unaided or if you’ll need to help them by tying shoots onto their support. It’s also important to know what kind of growing conditions each plant prefers. For example, climbing hydrangeas do best on a shady, north-facing fence, while the chocolate vine thrives in full sun. An important factor to take into account when making a smart fence is the weight involved. Some climbing plants are very heavy when mature so you must begin with a strong fence fixed to firmly anchored posts. If you’re not confident about your fence building skills consult a professional landscaping company experienced in supplying and erecting all types of garden fences. They will be able to design smart fencing to maximise your garden space, advise on a suitable planting scheme, and even do all the hard work for you!